Net profit is the proverbial bottom line of your business. It’s the number that you get after you subtract all of your expenses from your revenue. If your business is profitable after accounting for all of your expenses, your net profit will be a positive number. If you have more expenses than revenue, your net profit will be a negative number to show that you lost money. In business planning, you’ll find net profit listed in your financial statements, on both the cash flow statement and as the bottom line of your profit and loss statement (P&L). If you’re just getting started, you can download our free Profit and Loss Template or Cash Flow Statement Template, rather than setting up Excel spreadsheets and formulas from scratch. So, how do you know what your startup or small business’s net profit is? The standard calculation for net profit (also called net income and/or earnings) is your operating income minus interest, taxes, depreciation, and amortization. This means the money coming in from your sales, less all of your bills including the direct costs of sales. Operating income is also sometimes referred to as EBITDA, or earnings before interest, taxes, depreciation, and amortization. Some financial analysts consider operating income to be as important as the net profit itself, so make sure this is a robust sum. From this number, you subtract your taxes, interest payments the company has to pay on its loans, and any depreciation and amortization your business may have. The result is your net profit. 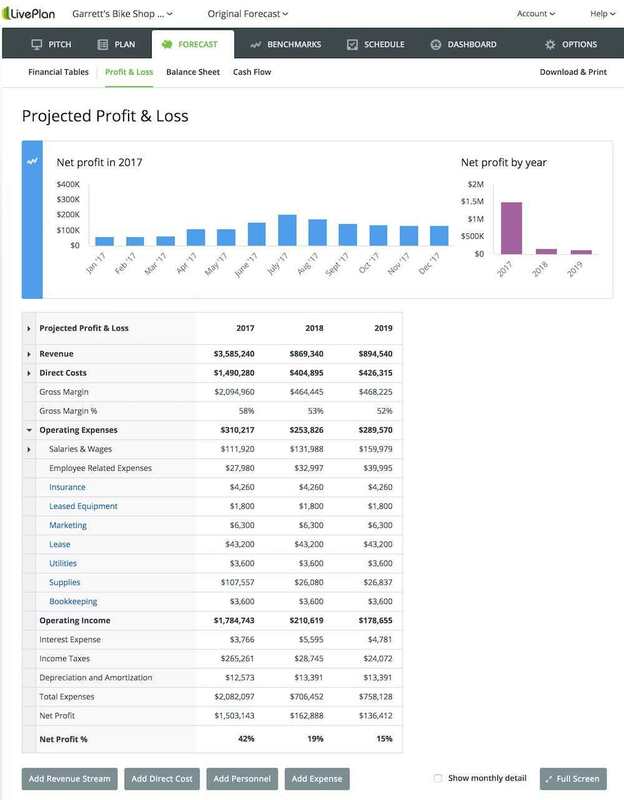 A profit and loss statement created in LivePlan. Net profit can be a negative number. Some profit and loss statements will even say “net profit or loss” to allow for the fact that, when things are going badly, this can be a negative number. If you’re not familiar with P&L statements, check out this guide on our LivePlan blog on how to read and understand your profit and loss. Net profit is understandably a metric that you’ll always want to see positive, and as high as it can be. If this number is negative, your business may be in trouble. You’ll want to review your expenses and also check your cash flow to get an accurate reading on not just your profit from sales, but the actual cash on hand your business has to stay afloat. It’s essential to remember that a profitable business can still go under if it runs out of cash. That’s part of why keeping an eye on your cash flow statement is so important. You may be wondering how a profitable business can run out of money. This can happen when a business makes sales that get booked as revenue on the profit and loss statement, but the actual cash hasn’t arrived yet. For example, if a business sends out an invoice that says “net 30” on the top, it may take up to 30 days (and sometimes longer!) to actually get the money in your bank account. So, if customers don’t pay fast enough, a profitable business can actually go out of business because they ran out of cash. How can you increase your net profit? Net profit is a question of sales versus expenses. To raise your net profit, consider possible ways to increase your revenue or figure out a way to limit your spending and bring your expenses down. Your tactics for increasing revenue or decreasing spending will vary, depending on your type of business, but these money-saving tips for businesses will help you think through some options. For more business concepts made simple, check out these articles on direct costs, cash burn rate, operating margin, accounts payable, accounts receivable, cash flow, profit and loss statement, balance sheet, and expense budgeting. Editor’s note: This article originally published in 2014. It was revised in 2018.